So we lost another one. Ouch. The New York Rangers are now 6-2-1, a great position to be at the start of the season and after tonight's lackluster performance, we are beginning to look like a normal team that has it's ups & downs. 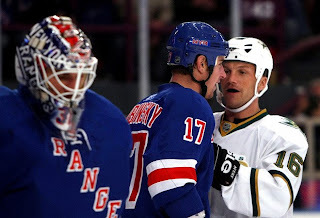 It is made worse in that this was the first game against Sean Avery as a Dallas Star and the first game where "The King's" Dallas twin brother Lundqvist was responsible for setting up the game winning goal to defeat the Rangers. For the official recap, go here. "I extremely enjoyed my time in New York playing for the Rangers. Jim Dolan runs a first-class organization. The fans are as passionate and as tough as they come, and they make MSG a very special place to play and call home. I wish the Rangers all the best.. I have no animosity towards anyone in this organization for not bringing me back." "High road" words from some guy named Sean Avery who showed up during the pre-skate mouthing off to Henrik Lundqvist, Stephen Valiquette and anyone within ear range of his big mouth. It doesn't matter who this guy instigates. There is no rhyme or reason to his bullying. When he successfully played for the Rangers for a season and a half, he was OUR bully. Now he is someone else's bully. In The Dark Ranger's book, 'plain & simple' this just makes him a PUNK. Everyone has shtick and a hook if you want to succeed in life, I guess. It's no wonder Sean Avery has no friends. He certainly isn't a friend of The Garden anymore. Yeah, I know Benedict Arnold was a traitor, someone who turned on his people, ratting out the good guys and some of you will say that it was MSG and the Dolans that didn't renew with Avery - it was widely reported that the difference between Dallas and NYR was just under a million a year. Avery as a Ranger on the ice vs when not on the ice demanded his re-signing. You cannot dispute the facts. I am a supporter of Sean Avery. I like his honesty and what he always brings to the game. But a case could be made that Sean Avery is the ultimate traitor to the game of hockey in general. He follows the money. As long as he continues to find new teams in the NHL willing to pay for his 'on-ice' dirty mouth, 'in the locker room' and his outrageous 'off-the-ice' antics, he will never find long-term loyalty of his teammates, the protection from his team and, most importantly, the honor one gets when you play for a franchise long-term. A thug-for-hire. Ultimately, he will never have a loyal fan base as he is guilty of having too many jobs in the short term, and realistically, this guy will end up hurt badly as someone is soon to punish him for his career behavior. When you declare your love for the team - you tell your agent where you want to be and do whatever is necessary to stay. Even NY Ranger Paul Mara re-signed with the Rangers for significantly less than he would have received in free agency because he believed in the franchise. Probably the best example of not following the money and believing in the game is the entire Detroit Red Wing 2008-2009 roster -- veteran All-Stars, including sought-after Marian Hossa, all believe in the game, rather than the money. The dumbest example might be Mats Sundin turning down a 2-year/$20 mill offer from Vancouver because he wanted the right team/retirement. Dallas might have won the game tonight -- they played terrific defensive hockey in the last half of the third period and shutdown my Blueshirts -- but they proved that it can all be done without the infamous Sean Avery - who did nothing to contribute to his team's win. He is 'half-a-Star' in my big bright book and 'an official hockey whore' having taken a better deal in Dallas and deceiving our MSG fans. Unrelated but just as exciting, The Dark Ranger is penning a new mystery short story entitled, "Where In The World Is Chris Drury?" - so I hope that all fans of the blog will channel positive thoughts toward our dear Captain! If good thoughts & cheer don't work for our Captain against Columbus on Friday, I expect all of you to pre-order an advanced copy and drink heavily. He owes EVERYTHING to the rangers. There is no sean avery without the support he got here. SEAN AVERY SHOULD HAVE NEVER BEEN LET GO!!! FIRST IT WAS BRIAN LEECH AND THE NEXT BELOVED PLAYER - SEAN AVERY - IS LET GO BECAUSE HE RUBS SLATS THE WRONG WAY. A BUNCH OF WUSSBAGS. Alias - the Garden gave Sean the stage he wants and demands, and served a sole purpose for the Rangers. He lit up the game and enabled a (at times) lazy perimeter play team. Dallas might be more money, but the stage is small. So you are right in my book. Anonymous - I sympathize, but you need to get over it! It's that simple. I am personally critical this season without Jagr, Shanny and Avery, but...we are playing better, faster and more-like-a-coached team since the lockout. We are finally going to the net and we look good. Maybe those MSG Wussbags have done us all a whole lotta Wuss-good! Pretty soon the team will lose it's confidence if they don't begin winning again.Yeah...they almost took Detroit, but they still lost? Almost vs. Dallas...I think not and they have a losing record. I think all this line changing is going to have a negative effect, as opposed to letting lines gel and connect. Renney and his coaching staff are in love with themselves a little too much at the front end of the season. Where you been Dark? Thanks for showing up! Don't let us down. I spend my valuable time coming to your damn site. I respect the opinions of dark and the posters here so far. I will say though that I second the notion that Avery should have been signed and playing for us. Truth be told, it appeared that no matter what Avery was ready to accept, Sather would have probably lowered is his offer just below that. Avery didn't respect Sather and Slats took it personally and sought to make an example of Avery just like he did at the arbitration hearing the year before with the "distraction" comments because he was mad at Avery for talking to the press about negotiations. It all came down to a matter of respect. Aside from a few extra thousand, Avery also got a no trade from Dallas according to what they were saying last night. It was a commitment to Avery, that says "we appreciate what you and your style can bring to our team and plan on making you a long term part of the way we play here." A stark contrast. As far as what Avery did last night. They guy did what he had to do. Dallas put their faith in him and pays his salary for what he brings to the game (just like we did). He can't say "oh ok, just not against the Rangers..." We'd have strung him up if he had said that kind of thing to us. "I think Brodeur had enough... I'm just going to lay off for games 3 and 4, ok?" Screwing with Lundqvist, the other teams goalie, is what he does... he chose Dubi and Valiquette in warm-ups as a starting point because they took some jabs at him in the press in the last couple of days and never said anything to his face when he was here and helping the team win. Our style now is better than it once was, but I hate the way that everyones crediting Renney as a genius and young fast legs for the execution. Shanny and his old tired legs tried to kick start this revolution at the beginning of last season, but Renney and everyone else was too busy rubbing Jagrs shoulders and trying to make him feel better about himself to commit to it. I'm still a fan but this fickle flip flopping on things is rather annoying and disappointing for a team I have grown up watching. All things considered, I sooner make a hand shake deal with Avery before I would with Slats. No offense to anyone whos already posted. Hey J...I like your style...if you think you have a unique voice, give me holler at srel1229@gmail.com -- always looking for new voices on the site. 1) In the long run the rangers may be better off with out the distractions Avery brought. 2) Losing to Dallas shouldn't deflate the team. Don't look at their early record. The Stars will be one of the best teams this season before all is said and done. You should make it a choose your own adventure mystery. jibble>>>I like your ideas! Play Budaj? or Don't play Budaj? It's a mystery. Always play Budaj....he is on fire!!! !